In one year, a baby undergoes more development than he will ever experience for the rest of his life. You can look forward to plenty of excitement as you watch your baby first lift his head, smile, and speak. Here are some tips to keep your baby's motivation high. The purpose of this article is really to inform and remind all parents of what to expect in the first year of your baby’s life. It was also a nice refresher for me, being that there is a 10.5 year difference between our middle child and our baby. While doctors and friends say, “Oh you’ve done this before,” with such a gap in between our children I feel like a first time mom, again. So read on and learn what to expect and how you can encourage your baby to grow and develop. In one year, a baby undergoes more development than he will ever experience for the rest of his life. You can look forward to plenty of excitement as you watch your baby first lift his head, smile, and speak. To keep his motivation high, give him constant positive feedback for each new development. Each month of life has its developmental milestones, so use this guide to monthly milestones to chart your baby’s growth. The first month after your baby is born is fairly uneventful, at least as far as milestone are concerned. 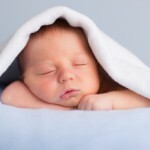 Your baby will spend the majority of his time sleeping, unless he is colicky, or is like my daughter who thinks that sleep is for “sissies.” However, when he is awake, you may notice that he is physically responding to his environment. He will gaze at objects around him, and move his arms and legs in a jerky way. He may also grasp your finger, and if you stroke his cheek he will physically react. Your baby may start sleeping less during the second month, which is a good thing actually, because it allows for more time for you to interact with your baby. When he is awake, he tracks moving objects with his eyes and makes basic sounds like “ooh” and “ahh.” Most enjoyably, he may smile for the first time, especially when he makes eye contact with you. It is also during this month that your baby lifts, or tries to lift, his head when lying on his stomach. Use positive verbal cues whenever your baby smiles or attempts to lift his head. During the third month, your baby will be able to completely lift his head when you are carrying him or when he is on his stomach. He may also reach for nearby objects, such as toys you put next to him in his crib. Our new daughter has no interest in toys. She wants to talk, she wants to move around… but she really doesn’t want to play with toys. He will also distinguish between his family and strangers. For instance, he may cry when he is held by a new person. You will also begin to notice that if one parent is the primary care giver, the one that is home with baby the most, then baby will prefer being with that parent over the other parent. If this is happens encourage your partner to try to spend whatever time possible with baby. Encourage siblings to also spend time with baby. During the fourth month, your baby will try to move more. He will roll over onto his stomach if he is supine, and he will try to reach for distant objects. Place yourself close to him and encourage him to move. You can also put one of his favorite toys just beyond his reach, to urge him to reach for it. We have what we call belly time, which is when I place my daughter on her belly as I move around I say, “Find mommy Miya. Where is mommy?” This gets her to look around and move around, this is how I got her to roll from her belly to her back in her first month. You will also have to closely monitor your baby because he may try to taste everything and put small objects into his mouth. If you listen closely, you will also notice that he makes different sounds for hunger, fatigue, and pain. 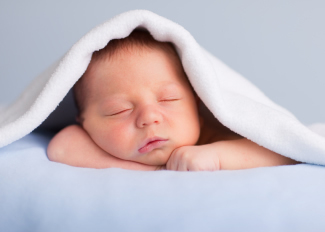 The fifth month is often pleasant for parents because babies usually settle into a regular sleeping schedule. There are certain times of day he wants to eat, as well as certain “naptimes” and “playtimes.” However, your baby will cry more often this month because he is teething. Getting a teething ring will help ease his discomfort. By the sixth month, you can usually start feeding your baby solid foods with a spoon. He will also be able to hold his own bottle and get into a sitting position. You will notice that he understands auditory cues. For instance, when you tell him “no,” he may look at you and stop whatever he is doing. He will also sense if you are angry or sad, so be careful when you are interacting with him. 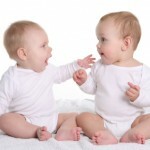 The seventh and eighth months are the time when babies try harder to expand their oral sounds. Your baby may blow “raspberries” and make other funny sounds as he tests out his mouth. It is also during this time that babies try to crawl, and often succeed. Your baby may enjoy having a fenced-off play area filled with his toys, which will motivate his crawling to play with each toy. By the ninth and tenth months, your baby should be able to clutch small objects, eat solid foods, sit without outside support, and make verbal sounds. He should be able to crawl, often crawling rapidly from one end of the room to the other. He is also able to understand what makes him happy or sad, so if you take a toy away from him, he will burst into tears. By the eleventh and twelfth months, your baby will most likely be able to say “mama” or “dada.” Many babies have a much larger vocabulary at this point, but verbal development is always disparate among infants. Many babies also have learned to walk by their first birthday, though this, again, is variegated. It’s also a good bet that your baby will try to climb, so you will have to keep a greater eye on him. My final words are this, there isn’t a set way that your baby will develop. 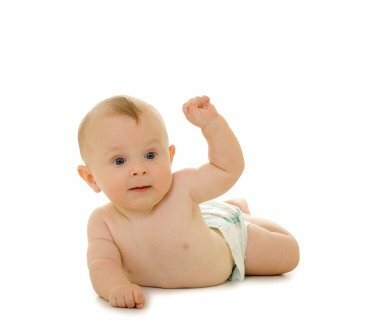 Each baby is an individual, and your baby may achieve milestones at 3 months that other babies achieve at 5 months. Don’t fret, encourage baby and understand that generally speaking all of these events will happen within the first year.